At first when I heard about twitter I thought oh no one more thing to do and learn so why bother. I really thought I am too old to learn to use this, so what would be the point. Then everything changed. I went to a workshop by Alec Couros and was about to embark on a professional journey that would change how I connected to school counsellors and educators from around the world. Twitter and the professional network I have developed has ultimately impacted the way I practice as a school counsellor in a positive way. As a school counsellor little did I know that opening a twitter account two years ago was one of the best ways I could develop professionally and connect with educators and school counsellors who are passionate about what they do. What is twitter you might ask and why is it so helpful? Twitter was founded in 2006. It is an online social networking platform that allows us to send and receive messages (140 characters). Within the body of the messages are often links to great resources or blogs or ideas that are just plain helpful. You can follow other educators and people who are associated with the ideas that are the most helpful to you. It is an extremely helpful tool that has impacted my professional life in a positive way linking me to educators who are creative, connected and willing to share ideas and resources. My PLN (personal learning network) helps me to learn almost daily. Today I need to thank @SISQITMAN for teaching me how to use word press in a more effective way. I met Glenn in ETMOOC which I found out about on twitter through @courosa which has been a gift to me as an educator. ALL the people in ETMOOC are always willing to help me as I am new to all this technology, but a most willing learner. Twitter leads to so many positive connections. How can I learn more about twitter and how to use it? Ask your colleagues who are on twitter to help. Hands on lessons are the best. Go to The Complete Manual for Understanding Twitter and learn more. Once you start tweeting you will love it. Those of us that have stayed with it and learned how to use it effectively absolutely love the benefits to our professional development. Digital literacy is becoming a required skill that school counselors will benefit from . Who knows where it might lead? You’ll be a techie before you know it. I would have never dreamed two years ago that I would be blogging, vlogging, sharing in Google hangouts or that I would be part of networks and Google communities that encourage and support each other. Thanks to Alec Couros @courosa and everyone in ETMOOC who has helped me. 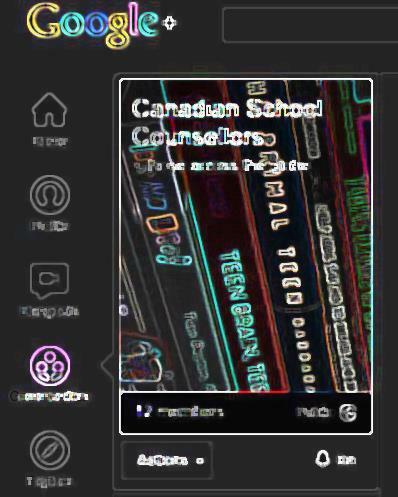 I believe I am a better school counsellor with so many more resources than I ever could have dreamed of. A big thanks also to Erin Mason @ecmmason I am connected in several ways to other school counselors who are always willing to help and point me in the right direction to resources. Thanks to @HaikuDeck who have allowed me to share with other school counsellors, educators, and a diverse group of connected learners from around the globe who have assisted in making me better at what I do. There is so much for us to learn together. I look forward continuing the journey.